We recently flew on Hawaiian Airlines from Hilo to Lihue, Kauai to support my son and the rest of the Hilo High cross country team (and all other Big Island runners) at the state cross country meet. The flights were quite expensive so we selected one of the more reasonably-priced ones that landed on Kauai at 10:30 p.m. After arriving at the airport, we got our car and went straight to Hamura Saimin for a late-night noodle fix. Yep–even though this trip is to support the athletes, we have to eat, right? And eat we did! We checked in to Kauai Marriott Resort at around 11:30 p.m. It is a huge property that was a kind of a maze–especially at that time. If you plan to stay there, be prepared to walk to get to your room, the beach, the lobby, the parking lot, etc. However, once we found our way to our room, even at that time of the night, we were impressed with the view from our room. The next morning, we found that the morning view of the pool and ocean from our room was even more amazing. We were a little sad to have to leave the hotel in the morning–but totally excited to cheer on the runners. After getting up early, we headed to Tip Top for breakfast. They have a Goteborg and eggs breakfast that I just had to order. My daughter enjoyed her oxtail soup. My husband saw a golfer friend at the restaurant who is the owner of Tip Top. Jonathan Ota is the fourth generation in the family to head this 101-year old business. The service was fast and the food was good. It gave us the energy we needed as we headed to Island School to cheer on my son, Hilo High, and the rest of the Big Island runners at the Hawaii High Schools State Association Cross-Country Championship. So much excitement, energy, adrenalin, and athleticism. Athletes wore their team shirts to show off their school pride. One of the shirts I saw had the clever phrase, “My sport is your sport’s punishment,” on it. So true for many athletes. Big Island runners had a great showing at this meet and I’m most proud of my son’s 13th place finish of the 200 best runners from the state of Hawaii. After lunch, we headed to lunch at Kauai Pasta in Lihue but because I programmed the wrong restaurant location into my GPS, we ended up at the one in Kapaa which wasn’t very far away. I enjoyed my $11.95 lunch combination of salad and pasta. After lunch, we headed to the hotel and made our way to the beach for sun and sand therapy. Dinner was sushi and sashimi at the Tip Top location where Sushi Katsu rents space. The middle photo below is the container of leftovers we took back to the hotel with us. The food was good and the serving sizes were generous. On Sunday, we slowly got ready and checked out of the hotel and drove about an hour to Waimea Canyon, the “Grand Canyon of the Pacific,” where we took a few quick family selfies. The road to Waimea Canyon is a bit windy and my daughter got some motion sickness. Luckily, there was a little vendor at the canyon selling ice-cold ginger ale. I think that the ginger ale must be a big seller there. 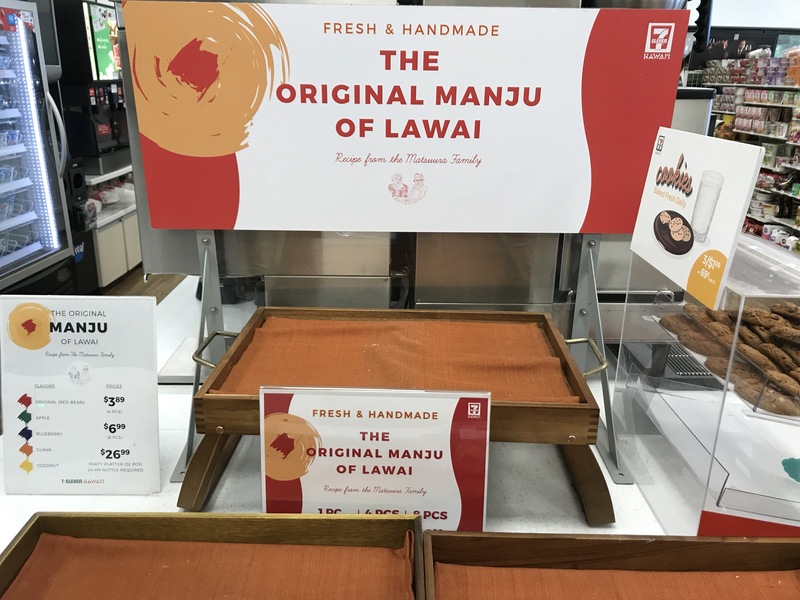 On the way back to Lihue, we stopped at the Lawai 7-Eleven so I could bring home some Lawai Manju but it was all sold out. I guess all the other cross-country families had the same idea as I did. Shucks. Despite not being able to bring home Lawai Manju, I am bringing home awesome memories of Kauai. Living Hilo Style on Kauai. My mother-in-law is from Lawai!